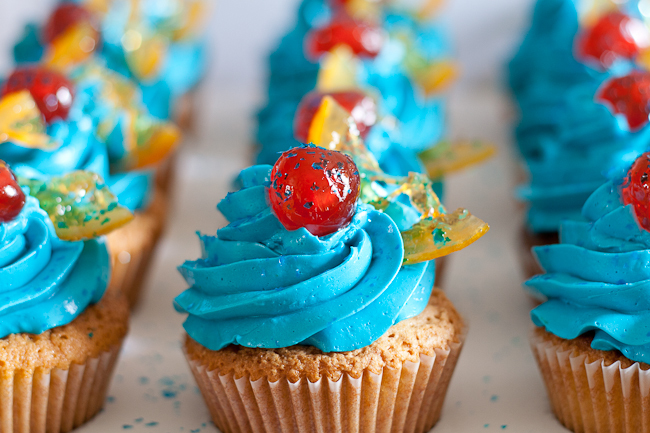 Cocktail Cupcakes — What the Fruitcake?! I have been meaning to post this for about 2 years. Seriously. I developed the idea for these cupcakes late 2009/early 2010, then there was a time when I was getting them right, tweaking this and that. When I did get them right, there wasn't time to take photos for a post, they were heading straight out the door for an 18 year old's birthday. Eventually I did take the time to get photos for a post, and there the photos sat, just waiting patiently while my life and other posts butted in ahead of their internet glory. But, we're just about at another bringing in of a New Year and I just couldn't let them sit on my harddrive untouched for another year. Besides, these would be great at a New Year's party! They'd also be great at, as aforementioned, an 18 year old's party (or 21 depending where you are in the world), a hen's night or just any occasion where you think they'd be appropriate. I know, they've been done before. Cocktail themed cupcakes where there may or may not be a spike of booze in the frosting. Colours and trimmings matching that of the cocktail in its liquid form. Mine are different. In fact, I dare say that mine are possibly the first. (In the internet searching I've done nothing like this has come up in any of my search results, but you never know, maybe someone just hasn't blogged them yet). Hidden beneath the seemingly innocent frosting flavoured with fruits and booze of your favourite cocktail, as would be in any other cocktail themed cupcake, and nestled snuggly in the sponge, is a jelly (jello) shot. A proper boozey jelly shot. The kind you make for parties that require jelly shots. Mostly alcohol flavoured with a bit of whatever flavour you think it needs to pass for a fun jelly shot, all held together with gelatine. Well, I say that, but here's where some of my time was spent, in perfecting that jelly shot. It all started when I was out with my hubby, we were enjoying lunch and I was on a new bloggers high. 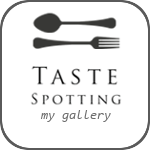 I was new to the food blogging world and, as I'm sure others have experienced, what seemed like millions of ideas were flowing forth, just waiting to be digitally input into what was my Wordpress part of the online world. 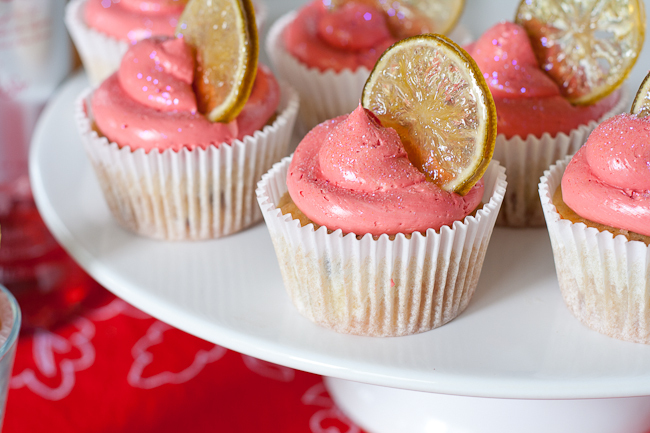 My candied lime slices need some work but these Cosmopolitan cupcakes were otherwise very tasty! I'd come across cocktail themed cupcakes and decided that I could make them better. I could make any recipe better at that stage! (I've come to learn that I'm not the only foodie out there and that many a recipe is better than mine). Actually, truth be told, this was my husband's idea, (and he likes to boast a little about this from time to time) why don't I put a jelly shot into the cupcakes? Um. Gelatine melts at room temperature, most cupcakes are horrible when kept cold in the fridge, you'd end up with a soggy mess of a cupcake. Thankfully, just about a week before, I'd come across agar agar. For those of you not familiar with agar agar, it's a vegetarian friendly gelatine made from a kind of seaweed, and in fact, it sets between 31°C & 40°C and will stay quite happily at room temperature without melting. Not only did I discover a fun twist on the cocktail themed cupcake, but vegetarian's could also partake and be merry! I also discovered that another name for agar agar is gulaman. Gulaman. Gulaman! That word's there on my list of novelty things to say like Labradoodle. Gulaman. I don't know why but it makes me smile. In my quest for spiking each cupcake with a boozey jelly shot I started out quite simply setting the agar in a dish, punching out circles of it with the same apple corer I used to punch out the middles of the cupcakes, and then simply inserting the jelly cyclinder into each one. It worked just fine, but I was sure it could be better. I didn't like that the jelly shot could fall out of the cupcake once you got to it. And then, ephiphany, agar sets really quickly in the fridge, even quicker than when it gets to room temperature, which was one of the things I had to get used to, keeping the mixture warm enough so that it stayed a pourable liquid but not so hot that all that lovely alcohol evaporated. More on that later. Pretty simply I figured the best way to get the jelly shot into the cupcake was to remove however much of the middle of the cupcake I wanted to fill. Pop the cupcakes in the fridge for 20-30 minutes so that the middles were nicely chilled, then letting the agar cool as much as I could allow it before it would begin to set, and once all the stars aligned and choruses could be heard (just kidding, it's not that tricky), pouring the agar into each cupcake. Once it hits the chilled sponge it sets immediately, forming a perfect barrier so that the agar didn't leech into the sponge but had time to set in the middle where it wasn't quite as cool. Right, about the alcohol evaporating thing. We all know that alcohol evaporates quickly when heated, and because agar needs to be kept above 40°C to stay liquid, you're probably wondering how I kept the alcohol in the jelly shot. Turns out it either takes a lot of heat or a lot of time to remove the alcohol from the liquid it's in. So when you're cooking a stew with a lovely red wine, because the nature of a stew is that it cooks for a good long time, the alcohol in the wine is pretty much gone by the time you eat it. Same as when you flambé something, the extreme amount of heat on a small amount of liquid evaporates the alcohol. Just to be on the safe side (the whole point of a jelly shot is the alcohol) I've come up with a way that I think keeps as much of the alcohol in the jelly shot as possible. I'm not a food scientist so I could be wrong, but from tasting my potent little agar shots, I'd say that I'm doing the right thing. What I do is I heat the agar with water/fruit juice/fruit purée and let it melt and cook with none of the alcohol yet added. Once the agar has melted and it's ready for the alcohol, I then heat the alcohol up to about 50°C and mix it into the agar mixture. You have to heat the alcohol otherwise if you add cold alcohol to the agar mixture it will cool too much and begin to set, and I heat it up at the end so that the hot alcohol isn't sitting around waiting for the agar mixture to be ready with its alcohol content evaporating. 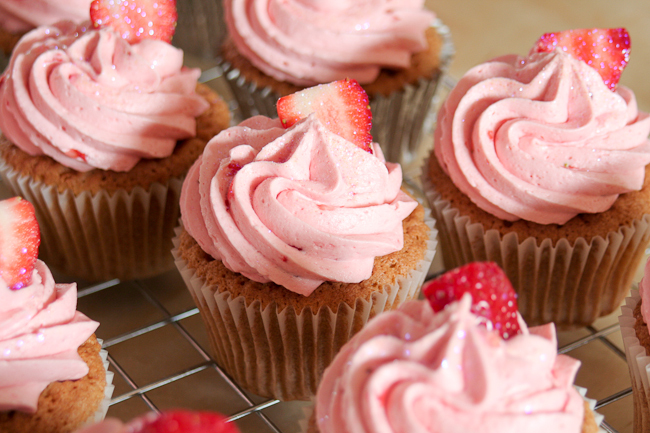 As you may have guessed from reading all of this, these cupcakes are a little fussy to make and do require a bit of skill or at least baking common sense, so if you've never made a cupcake in your life, you probably don't want to start with these. Below is the basic jelly shot recipe as well as a base recipe for vanilla cupcakes and Swiss buttercream that you can then take and put your own flavours to to make your own cocktail cupcakes, like my Flirtini cupcakes. My favourite frosting is Swiss Buttercream, I find it's not overly sweet like basic buttercream which is just what I prefer, but of course you can use any frosting you prefer. Add zests, liqueurs, alcohol or extracts to mirror your cocktail of choice. This makes enough for a generous swirl on 24 cupcakes. Easily halved. You can get agar in different forms. 1Tbsp flaked agar = 1tsp powdered agar. 1Tbsp flaked / 1 tsp powdered sets 1 cup / 250ml of liquid. I've used a bit more for ease of math and a firmer set. Posted on December 19, 2011 by Mandy Mortimer and filed under Baked, Sweet and tagged Agar agar Cocktail Cupcake jello shot jelly shot.